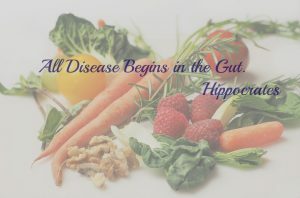 According to Hippocrates: “All disease begins in the gut”. And although 100% of every disease in every person cannot be completely blamed on the gut, researchers are finding that the health of our digestive tract plays an important role in many more diseases than we previously thought. And we are not just talking about intestinal issues like IBS, diarrhea, constipation and nutrient deficiencies. But also, wide-ranging problems throughout the body including inflammation and pain, allergies, changes in mood; even cognitive function such as memory and comprehension can be affected. There are several reasons for this. Our intestinal tract is where the nutrients we take in are absorbed and used as the building block for all process in our bodies. 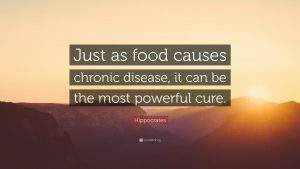 However, along with the vitamins and minerals, we also take in disease-causing bacteria, toxins, viruses and even parasites. These pathogens, if left to their own devices can wreak havoc on our health. This is where the microbes in our gut play an important role in protecting us from these ‘bad bugs’ We have only scratched the surface in learning how the gut communicates with the rest of the body, (you may have heard of the gut-brain axis) In reality it is not solely our digestive organs but the microbes living within that play a role in our gut AND our overall health. Our intestines function as a barrier maintaining a wall of protection to allow good things in and keep bad things out. And while this may seem simple and straightforward it can actually become problematic quite quickly. Unfortunately, our gut wall can get irritated when trying to digest highly processed food or food that causes sensitivities. When this happens, the mucosal wall becomes permeable and bacteria, toxins, and undigested food can pass into the bloodstream (called leaky gut). This causes inflammation and a host of detrimental reactions in the body that may not seem to be associated with the gut but actually originate there. Do you know 70% of our immune system lives in and around the intestines? An optimally functioning gut passes nutrients along for absorption, while it shuttles toxins and bacteria straight through to be eliminated without allowing leakage. Having this barrier in place is the first key to good health. It is not just the digestive organs themselves that we need to be concerned with. The microbes living within our gut are another component that is crucial for health. These friendly bacteria help us to digest and absorb nutrients while fighting off the harmful pathogens. In addition, consequences of poor gut health can be felt throughout the body in the form of joint pain, inflammation, and even affecting mental health and cognitive function. So, what do we need to do to have happy healthy microbes? Many things can upset the balance and cause digestive trouble. Ideally, if we can eliminate these irritants it will go a long way toward repairing and improving gut health. Added sugars, chemicals, alcohol and processed food are all seen by the body as toxins. And for some people, dairy and grains cause severe reactions. Try eliminating some or all of these triggers and you may be amazed how much better you feel. Foods full of vitamins, mineral, and antioxidants like rich colorful vegetables, and dark leafy greens can help repair the gut, and the rest of the body. These plant-based foods are full of fiber and fiber is all important in reducing your risk for cardiovascular disease, diabetes, cancer, and obesity. The fiber also feeds the good bacteria and shuttles toxins and bad bacteria away to be eliminated. Including probiotics in our daily diet helps to build up our stores of beneficial microbes and improve the ratio of good microbes over bad. Probiotic-rich foods include yogurt, kefir, sauerkraut, kombucha, miso, etc. Lastly, don’t discount how getting adequate sleep, reducing stress, and exercising regularly play a big part in our overall health. Sometimes it is the simple things that can have the biggest impact on how well our bodies function. Remember, gut health is an indicator of overall health, you can improve your gut health by reducing common irritants such as added sugar, alcohol and processed foods, and instead, eating a diet full of rich nutrient dense foods. These help to ensure the intestinal walls remain intact and feed the microbes so they can fight off the pathogens that, if left unchecked, can take us down.